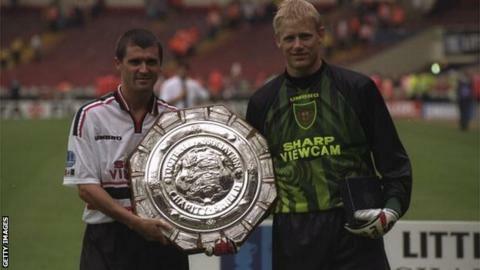 Former Manchester United captain Roy Keane has revealed that he came to blows with goalkeeper and team-mate Peter Schmeichel on a pre-season tour. Keane, 43, said Schmeichel was left with a black eye after the fight in Hong Kong in 1998 which followed simmering tension between the pair. Keane said: "He said: 'I've had enough of you. It's time we sorted this out.' So I said: 'OK' and we had a fight." The episode is recalled by Keane in his new autobiography 'The Second Half'. Keane, now the assistant manager for Aston Villa and the Republic of Ireland, said drink had been involved in the incident with Schmeichel, who he played alongside at Old Trafford for six years. Roy Keane won seven Premier League titles as a Manchester United player. Keane won 67 caps for the Republic of Ireland and played at the 1994 World Cup finals. He was named the PFA and Football Writers' Association player of the year in 2000. He managed Sunderland and Ipswich, leading Sunderland into the Premier League in 2007. "I woke up the next morning. I kind of vaguely remembered the fight. My hand was really sore and one of my fingers was bent backwards," Keane is reported as saying by the Daily Mirror. Keane discusses a number of controversial topics in the book, which is published on Thursday. They include a reference to a tackle on former Manchester City midfielder Alf-Inge Haaland in 2001, which Keane suggested in his first autobiography was to avenge an earlier incident between the pair. The comments earned Keane a five-match ban and £150,000 fine from the FA for bringing the game into disrepute. "There are things I regret in my life and he [Haaland] is not one of them," Keane added. However, Keane says he does regret apologising to former United manager Sir Alex Ferguson over a MUTV interview which hastened the Irishman's acrimonious departure from Old Trafford in 2005. The book was mistakenly put on sale 72 hours earlier than its scheduled publication by a Tesco store in Burnage, Manchester, and the contents were published by national newspaper websites soon after.